J Lawrence Isherwood suffered many blows during his lifetime, but undoubtedly the day fire raged through part of the downstairs rooms of the house was, other than the death of Mother Lily, the worst. The semi-detached house on Wigan Lane had been the Isherwood family home for many years. It was bereft of central heating and a coal fire and oil heaters were the only source of heating. Following the death of Mother Lily in 1981, the artist lived alone there, except during his relationship with Mrs Pat White, when 151 remained cold and empty for several years. But in the summer of 1983, the artist was living at home and it had been an ordinary day until he decided to make himself a meal at around four in the afternoon. His habit was to put greased proofed bread wrappers at the side of the ancient oven, and on that fateful and disastrous day, as he was eating his meal in the dining room-studio, he smelled smoke. The kitchen was ablaze and by the time the fire brigade arrived, the kitchen was wrecked and the house totally smoke damaged. Molly Isherwood takes up the story: “With my husband Gordon, I had been to the funeral of an old friend. It was the day of our wedding anniversary. When we got home we celebrated with a glass of wine. All very relaxing. Suddenly the phone went and it was the police to say there had been a serious fire at Jim’s home and would we go immediately. “We raced to Wigan in the car and Jim was in a terrible state. It was as though he was furious that the fire had happened at all. The flames were out but we were met by a scene of smoke blackened rooms. Paintings that had been kept in or near the kitchen had been badly burned and had been taken into the overgrown garden at the back. “Jim was beside himself at the loss of the destroyed paintings – there must have been several hundred – and in particular one large oil of his Mother Lily as the Lancashire Madonna. This he treasured more than all the rest. “It was a terrible blow for Jim who had to set about trying to clear things up but the task was greatly beyond him. I know he was awarded £17,000 from the insurance company and I also know he didn’t spend it trying to get the house back to something like normal. But after the fire, it seemed that Jim Isherwood lost some interest in life. He did still travel but his health began to fail. He couldn’t be bothered with aspects of life he’d been enthusiastic about. 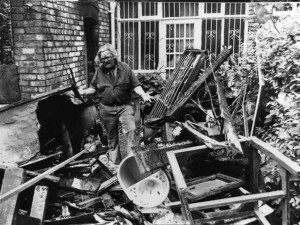 It was several years after his death that the new owner of 151 Wigan Lane discovered fire damaged and smoke damaged paintings still piled up in the overgrown back garden. Some of these were sold by the auctioneers, Capes Dunn in Manchester, just before Christmas in 2008.